When it comes to Jamaica, reggae and Red Stripe go hand in hand. To continue to bring a taste of Jamaica to more and more people beyond the island and to celebrate the 100-year anniversary of Jamaican brewer Desnoes Geddes Limited (D&G), Red Stripe has teamed up with LA based Jamaican musician & producer Paul “Pablo” Stennett and a number of Jamaican artists to create original singles representing the evolution of Jamaican music throughout the years. Red Stripe officially debuted the first single from the album with a live performance from reggae artist Christopher Martin at this Saturday’s, “Wayup Stayup” block party @ Wynwood Artwalk, an event marking the official countdown to the premier festival of Jamaican music, Reggae Sumfest to be hosted in Montego Bay next month. JAMAICA has long been known to be a cultural powerhouse since the days of Bob Marley. It is a small island that impacts culturally on the rest of the world mainly through its music. I am in this country at the moment enjoying the sweet spirit of the passionate, fun-loving and friendly Jamaican people. Reggae music was born in Jamaica. That is a known fact, but many subcultures have merged reggae with their own music to create new genres such as Zimdancehall, hip-hop, and reggaeton. Jamaica is also the birthplace of Rastafarian culture. At the weekend beginning June 1, I was supposed to attend the One World Ska and Rock Steady Music Festival in Sabina Park, Kingston, but the line-up of artistes billed for this festival did not impress me enough to part with my $50. The only group I had heard of before was Toots and The Maytalls. There were artistes such as Delroy Thompson and Ansell Collins whom I had never heard of before. Most of the artistes I wanted to see performing there were abroad entertaining patrons in America and Europe. How I wish I could extend my vacation so that I can watch some of the most talented Jamaican artistes who will descend on Montego Bay next month for the popular Reggae Sumfest. Montego Bay, affectionately referred to as MoBay by the majority of Jamaicans, hosts thousands of festival goers every year at Reggae Sumfest. Instead of attending the One World Ska and Rock Steady Music Festival, I spent time with an old friend, Boisie Woolcock, author of the 1970s monster hit I Wonder and a close associate of Bob Marley. Together, after briefly stopping at Sir Jimmy Cliff Bay (yes, the Jamaican government has honoured Jimmy Cliff for all his contributions over the years in promoting Jamaican culture with his music and acting prowess in films such as The Harder They Come), we visited The Bob Marley Museum at 56 Hope Road in Kingston and then The Peter Tosh Museum, both of which gave me a new insight into the lives of the two reggae icons as I saw new memorabilia of their lives. The Bob Marley Museum has undergone some structural upgrades and renovations to enhance the visitor experience since the last time I visited Jamaica. Musically, things have also changed in Jamaica. Dancehall seems to be dominating the musical scene everywhere. New tunes such as Chant It by Sevana, Blood Money by Protégé and Humble Mi by Jah 9 seem to be the happening tunes of 2018. Ten years ago you would hear only Bob Marley tunes such as One Love and Three Little Birds playing all over Jamaica, but today there is a variety of popular tunes such as Chronixx’s Smile Jamaica and from the old school collection songs like Third World’s Try Jah Love. “Really?” I said. “I have often thought that I was a genius, but this one, I never worked it out,” I told him. We moved on to New Kingston’s Courtleigh Auditorium to attend a commemoration concert for the late Sugar Lincoln Minott, who died from a heart problem on July 10, 2010. It was quite revealing. I had known of Sugar Minott from long ago when I collected hundreds of reggae records, but had never considered him among the big Jamaican artistes. So you can imagine my surprise on seeing thousands of reggae lovers in this auditorium remembering their music hero. Apparently Sugar Minott did a lot of work with the youths and other aspiring artistes in Jamaica. He liberated them from the doldrums of poverty through the formation of his Black Roots record label and Youth Promotions Organisation where any talented youngster would come and get assistance in recording their music and having it published and distributed without any payment. Most of these youths would then come to Sugar Minott if their record was doing well to receive their royalties. I am told that his organisation was responsible for bringing up Jamaican artistes such as Tony Tuff, Barry Brown, Junior Reid, Tenor Saw, Jah Stitch, Captain Sinbad and dozens of others. Among Sugar Minott’s stand-out cuts were This Old Man, Get Ready Rock Steady, Party Night, Youth of Today, Mysterious Nature and No Cup No Broke. We moved on to have lunch at Dunns River Falls in Ocho Rios, St Ann, a smaller version of our Victoria Falls but attracts over 50 times the number of tourists. Even the legend of Bob Marley comes alive as you walk through his home location in the village of Nine Miles. This is the very house Bob lived in as a young boy and we met so many people, now in their 70s, who knew him as a little boy. Each one had a story to tell. One told me how Bob was great as a footballer and another told me how they shared the same girlfriend and how they fought over her. I also met Lee Perry’s aunt who claimed that her nephew wrote many of the songs Bob recorded. This experience gave me first-hand knowledge of the life and times of the great musician from the people who lived there with him. A lesson for Zimbabwe’s tourism industry and culture ministry: If you design cultural programmes for the thousands of unemployed youths who are in this country and assist them to develop them, they will feel a sense of responsible citizenship. One or two might rise to be Zimbabwe’s ambassadors in the near future and will do all of us proud as Bob Marley has done for Jamaica. Do not look down on culture. In Jamaica it is drawing hundreds of thousands of tourists every year and has become the biggest economy booster in that tiny island. We can also do it. Come on now! The momentum leading up to Reggae Sumfest, dubbed “reggae nirvana” (New York Times) and “quite simply the be-all and end-all of reggae festivals” (Forbes), builds with anticipation before its 8-day takeover in Montego Bay next month (July 15-22). Following NYC’s Reggae Sumfest launch party in April, events in Kingston (May 30) at Usain Bolt’s Tracks and Records and Montego Bay (May 18) at the Iberostar Suites transpired to gear up for the festivities. This Sat. 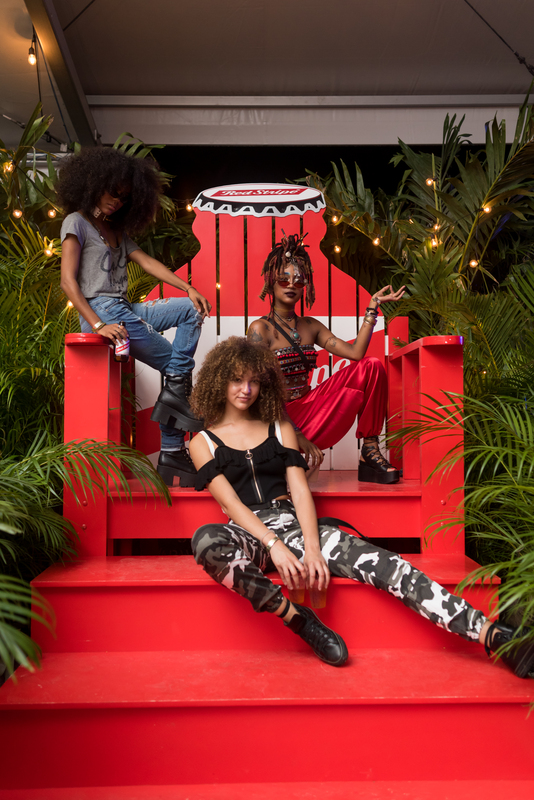 June 9, Red Stripe Presents Reggae Sumfest will take over Miami’s Wynwood Artwalk for the official countdown to the festival. The launch will feature live DJ sets and a performance by Jamaican singer Christopher Martin, who has performed on the Reggae Sumfest stage multiple times. In addition to the title sponsor Red Stripe, MasterCard, NCB, JetBlue Airlines, and Grace Kennedy are new sponsors this year with JetBlue as the presenting partner for the live stream. Reggae Sumfest 2018 marks 26 years of stellar Jamaican entertainment. The year’s annual affair begins with a variety of pre-parties including the Colourfest Beach Party on Sun. July 15, Sumfest Street Dance on Mon. July 16, All-White Party on Tues. July 17, The Blitz All Black Party on Wed. July 18 featuring Stefflon Don and Safaree and Sumfest Presents Irish & Chin World Clash 20th Anniversary on Thurs. July 19. The festival’s two main concert nights take place at the historic Catherine Hall venue on Fri. July 20 and Sat. July 21 featuring live performances from Popcaan, Sizzla, Aidonia, Sasco, Masicka, Spice, Beres Hammond, Damian “Jr. Gong” Marley, Maxi Priest and many more. Patrons can access updates on the line-up, tickets and events on the official website: www.reggaesumfest.com. Reggae Sumfest boss Joe Bogdanovich, chairman and CEO of Downsound Entertainment (DSE), producers of the iconic Jamaican music festival, has landed a partnership with global payments giant Mastercard. “The initiative with Mastercard is one which will see us taking the first step towards a cashless festival,” Bogdanovich told the Jamaica Observer. “Mastercard is a leading global payments and technology company and with its ongoing help, we will continue to take Reggae Sumfest into the technological age,” he added. This is the second partnership agreement with an international company announced by Bogdanovich since the recent launch of the festival, scheduled for July 15-21 this year at Catherine Hall, Montego Bay. Last week, he announced that North American carrier JetBlue Airways had been confirmed as one of the premium sponsors of Reggae Sumfest 2018. According to Bogdanovich, DSE, which acquired the Sumfest Brand in 2016, welcomed the addition of JetBlue to the raft of sponsors. “The fact that JetBlue, an overseas-based company, recognises the value of the Reggae Sumfest brand on the global scene, clearly demonstrates its growth in influence and importance over its history,” he said. “Jamaican music, since the 1960s, with the emergence of icons such as Bob Marley, Toots Hibbert, and Jimmy Cliff, has not only captured the imagination of numerous people across the globe but has been integral to the mushrooming of Brand Jamaica. Reggae Sumfest is, perhaps, the most influential vehicle to leverage and sustain Brand Jamaica and further promote the island and its music,” he noted. Sepp Donahower, director, global marketing for DSE, pointed out that JetBlue is the official and exclusive airline partner for Reggae Sumfest 2018, and would be the presenting sponsor for the live stream of the festival on all DSE platforms. Since the acquisition of Reggae Sumfest, DSE has been engaged in bringing world-class high production live streaming and video content of the festival to the world on multiple platforms. In 2017, Reggae Sumfest’s live stream and uploaded videos recorded more than 1,250,000 views. This year, it is expected to continue this explosive streaming and viewing growth, which brought JetBlue in as a presenting partner for the stream. Fans will be able to access the live stream through the live streaming page on the festival website reggaesumfest.com, even though, as Bogdanovich pointed out, “there is nothing that can replace the energy and excitement of being at Catherine Hall live”. JetBlue is New York’s hometown airline and a leading carrier in Boston, Fort Lauderdale-Hollywood, Los Angeles (Long Beach), Orlando, and San Juan. The airline carries more than 40 million passengers a year to 102 cities in the US, Caribbean, and Latin America with an average of 1,000 daily flights. “We are very proud of what we have been able to achieve in the past two years. We built on the firm foundation laid by the Summerfest team, and it is our intention to grow the festival further. In keeping with that objective, we are offering patrons more and more each year,” Bogdanovich said. “The use of credit, debit, and prepaid cards and other types of cashless payment options provide a safer and more convenient way for people to shop, and we are pleased to be able to introduce some of these options for Reggae Sumfest,” he said. “While this year we are offering the more traditional payment options, we look forward to working with Mastercard, which we hope to be our long-term partner, to introduce many more innovative technological solutions to Reggae Sumfest in the years to come,” he stated. Uhriel Bedoya, Mastercard country manager, Jamaica, Trinidad & Tobago, Bermuda, and Haiti, said his company was very excited to partner with Sumfest and to expand the benefits of electronic payments to patrons. “With extensive experience in supporting the growth of payments, Mastercard is uniquely positioned to provide the platform that can propel Sumfest along increasingly ambitious growth paths,” he added. He said that one of the major thrusts for Mastercard’s relationship with the festival this year is to offer a 20 per cent discount on tickets for the main festival, on July 20 and 21, when customers pay with a Mastercard branded prepaid or credit card. Additionally, with the Mastercard Fast Lane Entry to the event, Mastercard cardholders can skip the general admission line. What is more, when concertgoers purchase their tickets with their Mastercard, they will gain entry to an exclusive Mastercard parking area. If the parking reaches maximum capacity, the Mastercard card will give you access to the Mastercard shuttle service. This year Sumfest will also be introducing another new element into the mix — the Sumfest Mall, which will showcase a variety of authentic Jamaican products for sale. Marcia McDonnough, Sumfest marketing consultant, said that the producers are very excited about the Sumfest Mall, as it will further enhance the festival experience by offering up to 24 curio shops with a delightful array of fascinating objects of art, craft, jewellery, clothing, leisure products and souvenirs that will serve as mementoes of patrons’ visit to Reggae Sumfest. “We have carefully selected our merchants to make sure we present top-class items which for the most part are original works and also Jamaican-made. The relationship with Mastercard and the focus on ensuring that we have the equipment that will accept credit and debit cards all across the venue will make it easy for patrons to ensure they leave the festival with something special,” she noted. Dorrette Watson, owner of D’Nex Step Sandals and Accessories showing off her creations at Reggae Sumfest launch held yesterday at Downsound Records on Belmont Road. Local entrepreneurs who will be selling items at this year’s Reggae Sumfest are praising organisers of the festival on their decision to go cashless. The announcement was made at the headquarters of Downsound Entertainment yesterday. Sumfest will partner with Mastercard to give patrons a safer, more efficient way to purchase items come July 15 to 22. With the Sumfest team introducing a ‘mall’ concept this year, in terms of the set-up for vendors, the cashless system will maximise the consumer’s shopping experience at Catherine Hall. “We’ve always had vendors at the festival but the way we are presenting them this year is a bit different. We will be making sure we have those credit card machines all over the venue, anywhere you will need to make a purchase, if it’s drinks, more tickets at the venue, the food court or the mall,” said Marcia McDonnough, marketing consultant for the festival. Present at the media briefing, disclosing the details of the partnership with a few of the vendors who will be stationed at this year’s mall. Pointing out that not only is the cashless option safer for patrons, a few of the vendors highlighted that the move may maximise their earning potential. Randy McLaren, managing director of Bresheh Enterprises, that sells locally made knapsacks, totes, laptop sleeves and pencil pouches, applauded the Sumfest organisers on the Mastercard deal. Dorrette Watson, owner of D’Nex Step Sandals and Accessories, also welcomed the idea. “I know for a fact that when people come to these festivals and they stop by the stalls they will see something they like. Many of them will want to buy but not have the cash. With the card, you can get what you want on the spot,” she said. For potential patrons without a Mastercard, Uhriel Bedoya, Mastercard country manager, encouraged patrons to get one before making the trek to Montego Bay. Marketing consultant for Reggae Sumfest, Marcia McDonnough (left), Joe Bogdanovick of Downsound Entertainment (second left), Robert Russell of Reggae Sumfest (second right) and Uhriel Bedoya, Mastercard Country Manager for Jamaica, Trinidad and Tobago, Haiti and Bermuda, at Downsound’s Belmont Road, New Kingtston, offices yesterday. For the first time in the festival’s 26-year history, Reggae Sumfest will be going cashless. The announcement was made yesterday morning at Downsound Entertainment’s headquarters on Belmont Road, New Kingston. Sumfest has partnered with global payments giant Mastercard, so come July 15-22, patrons will be able to make purchases at all the different facilities set up at Catherine Hall, Montego Bay. In their official press release about the partnership, Bogdanovich expressed a desire to work with the Mastercard team on a long-term basis. Yesterday, Uhriel Bedoya, Mastercard country manager for Jamaica, Trinidad and Tobago, Haiti and Bermuda, said “Partnering with Sumfest is tremendous, because we meant it when we said we are committed to Jamaica as a market. Our partnership with Sumfest is just the beginning, so stay tuned. We don’t make commitments on one-year basis or short term, we are looking to make longer-term commitments, so this is a way to start our Jamaican journey. For us, Sumfest is about the experience, and we want to make sure the attendees at Sumfest have a seamless experience from the moment they acquire their tickets.” While supplies last, Sumfest tickets purchased with a Mastercard at any of the outlets will see the buyer obtain a 20 per cent discount. Safety also played a role in Sumfest’s decision to go cashless. Not keen on speaking too much on the crime situation and the state of emergency – or enhanced security measures – currently on in St James, the Sumfest organisers explained that cashless is a way they can help to ensure patrons have a safe experience. “We know how it is sometimes; you don’t want the security risk of having a lot of cash on you. We are working with the cashless environment, so you don’t have to walk with cash at all. We are also doing it so that if you don’t have enough cash, you have your card,” explained marketing consultant for Reggae Sumfest, Marcia McDonnough. Many will remember him as the high school student who blazed dancehall with his brilliant song, ‘Lightning Flash’. Lately, airwaves have been choked with the rotation of his recent hit, ‘Last Days’, as well as the follow-up banger, ‘Partner Draw’. For the month of June, stay tuned as THE STAR reintroduces Shane O, dancehall child star turned formidable dancehall artiste. For years, the artiste said that he was out of the public eye, toiling behind the scenes of the local music industry, a fact he says is no one’s doing but his own. This year, Shane O has returned and appears to be ready to roll. “Mi used to go a my bed a night time and seh, ‘bwoy! A when mi a get my chance fi go every weh like everybody?’ See it deh! Is a ting weh me always prepare for and a wait because mi know it did a go come back, enuh. Cyaa blame people. Yuh haffi just keep up yuh work,” he told THE WEEKEND STAR. To answer how the public has been responding to his return, Shane O scrolled his phone’s gallery for a moment before pulling up a video clip of a recent performance. The clip showed Shane O performing Partner Draw, with the crowd yelling the song’s lyrics back at the deejay with enthusiasm. “Yuh see the crowd? If yuh nah work, dem a go walk past yuh. So anytime when yuh get a chance, yuh just haffi try keep up. Mi just a gwaan put out song. If it nah work, mi a work. Yuh just haffi work with the crowd. Wah me a go do? Mi a just do weh mi haffi do. When you keep up, them will always link yuh. If yuh nah work, who a go link yuh?” he said. “Yuh haffi be a Bounty Killer or a Beenie Man weh constantly have song even if a nuh hit song. Yuh constantly have song weh inna some kinda rotation,” echoed his manager, Heavy D.
Shane O’s return to the dancehall arena will be marked by a performance on the coveted Reggae Sumfest stage this year. The comeback kid has already been making the rounds, and by all appearances, his fans are as excited as he is about the renewed vitality of his career. As for how it feels for Shane O to be rocking stages again? “Bwoy, it feel good, man. Mi just a bounce all bout and gi’ dem a style! A great feeling! A great feeling dat, man, see dem a sing out word for word,” the artiste exclaimed.